“Needlework is an art so indissolubly connected with the comfort and convenience of mankind at large that it is impossible to suppose any stage of society in which it has not existed.” The Countess of Wilton in “The Art of Needlework,” 1840. Young ladies of the Regency period were usually trained in some sort of craft or needlework by their mother or governess. Indeed, they often possessed fancy workboxes or bags into which went the needles, threads, and the other implements for “Genteel Females” to use. It was amazing all it could hold. 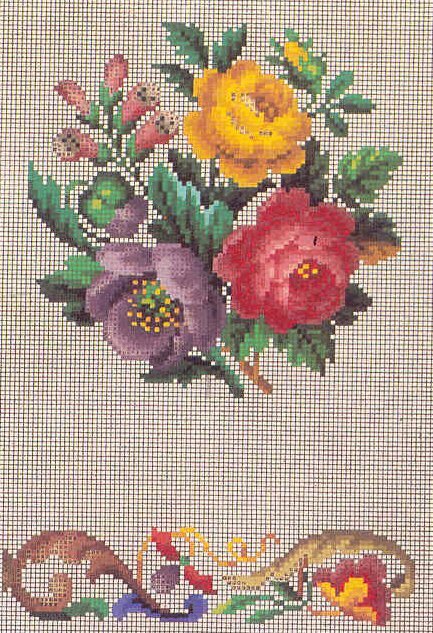 It was the receptacle for the much-worked-on sampler, a labor on which many young girls practiced cross stitch and other kinds of stitches. Some samplers were worked in wool thread. Many of the samplers were worked in colorful silk threads. Most had the alphabet with a motto or verse, initials and date of embroidery on them. 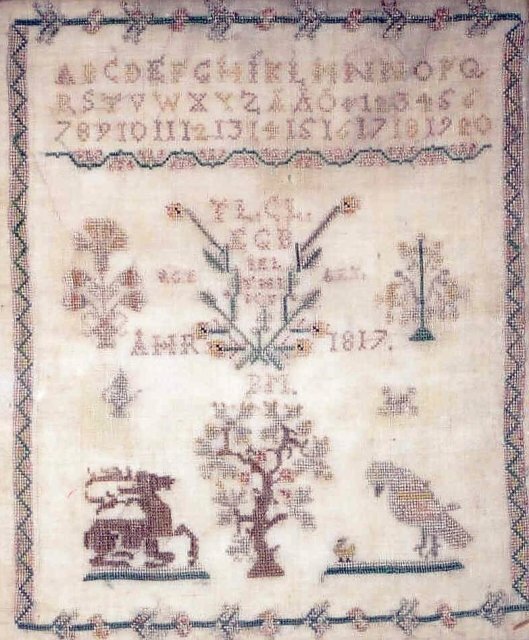 These samplers were most often a way for a girl to show she had learned her stitches. 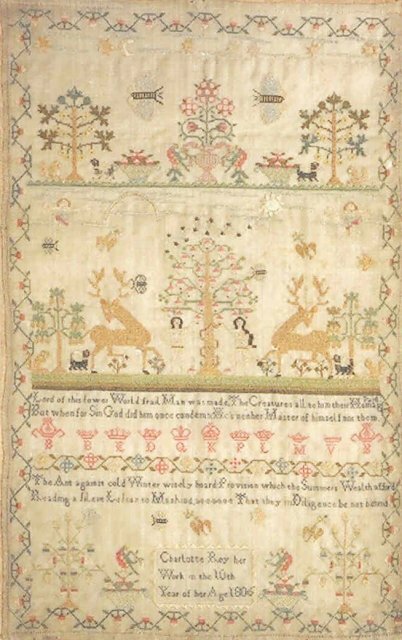 The Victoria and Albert Museum in London has many fine examples of samplers from several centuries. Needlepoint was perhaps the most universal of talents employed. Some young ladies, inspired by a painting or engraving, adapted the view to needle and thread. 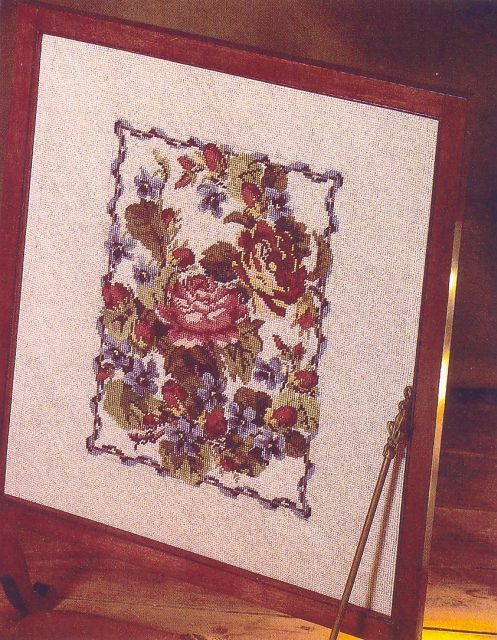 They often used a small embroidery frame to keep their work smooth and taut. Other frames were mounted on wooden legs so that the whole affair stood on the floor before the person, much as we use today. The advantage of this was that one could work with both hands, pushing the needle through the front of the canvas with one hand and pushing it back with the other. It speeded up the stitchery, kept the canvas from warping, and ultimately meant less stretching was required of the finished work. Patterns were often obtained from friends or from a copy of a Ladies’ Magazine. As early as the Tudor period there were pattern books widely available. Samplers from that time include elaborate designs of birds, fishes, flowers, and plants. In 1804 a seller of prints in Berlin issued a colored needlework design on squared paper. Prior to this there had been patterns printed in black and white on ruled grids, with the black squares as the stitch. Having the design colored meant that not only could one copy the design by square but also the colors selected for the pattern. These became extremely popular and a Berlin printer and bookseller named Wittich enlarged his business by offering many designs to needle workers, an endeavor which quickly became quite lucrative. He began with floral motifs designed by his wife, then expanded to other designs. Between 1810 and 1840 no less that 14,000 designs were produced for needlework and it is estimated that thousands of people were employed to draw and paint the designs on graph paper. Rudolph Ackermann sold Berlin patterns in his shop in the Strand. Women’s embroidery was the other main area of needlework most often done on items of apparel, but also altar cloths and other household items. Executed on fine linen or cotton fabric, designs were traded (much like needlepoint) between friends and often found in the sources such as The Lady’s Magazine. I have several of these patterns. One is “A New & Elegant Pattern for a Screen.” Featuring oak leaves and acorns around the outside, it has a bouquet of flowers in the center. Another is “A New & Elegant Running Pattern for a Dress.” There is also “A New & Elegant Pattern for a Cap, Crown and Border” as well as “A New & Elegant Pattern for a Shirt” that has a design of leaves and berries in two bands down the front with embroidered Dots over the front and on the sleeve. 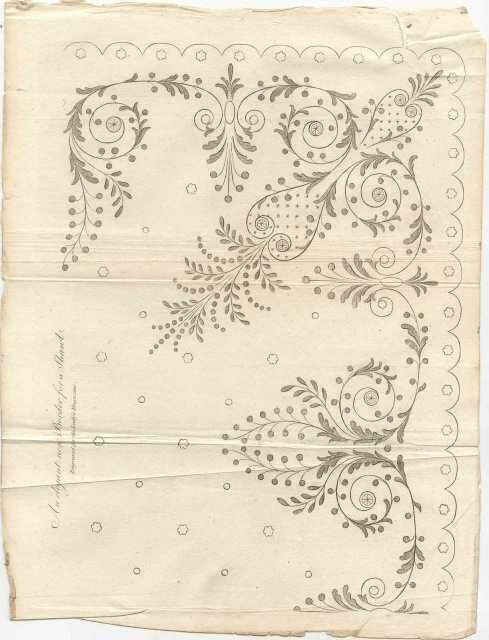 Then there is a “Fashionable Border for a Scarf or Veil.” Many of the little elements of the designs are very similar. Before these were published women often had to rely on a pattern-drawer. These were usually women, but boys as well created designs for the embroiderer. They also did drawings for calico-printers, lace workers, quilters and apparel. “They draw upon paper which they sell to Workmen who want them. Men’s waistcoats, women’s petticoats and other wearing apparel; for all of which they have large Prices.” Taste wasn’t an issue - rather a “wild imagination” was required. Unlike the designs for The Lady’s Magazine that needed enlarging to use, these were working patterns. I have a few of these designs and they are beautifully delicate, with flowers and scrolls and sprays of greenery. 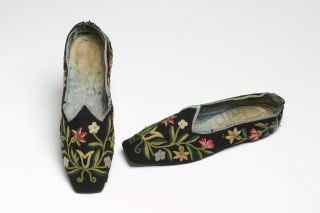 Young girls often embroidered slippers as a gift to their fathers at Christmas or perhaps a birthday. This was wool-work, mostly on canvas and as complicated or simple as pleased the young lady. Sometimes the design was his crest, other times it might be initials. Women often made slippers for themselves to wear around the house when the practice of wearing boots out and about became general and they wanted comfortable footwear at home. They were frequently lavishly embroidered. Patterns could be purchased for women or gentlemen’s slippers. Most slippers were taken to a shoemaker to be lined and finished. Shell-work was another craft that proved popular. Ladies of the 18th and 19th centuries collected sea shells, often housing them in cabinets fitted with little drawers to take the different size shells. Shell ornamentation was used on a great variety of objects. From a drawing room chandelier to picture and mirror frames. Then there were shell pictures; nosegays of natural colored shells in great variety. 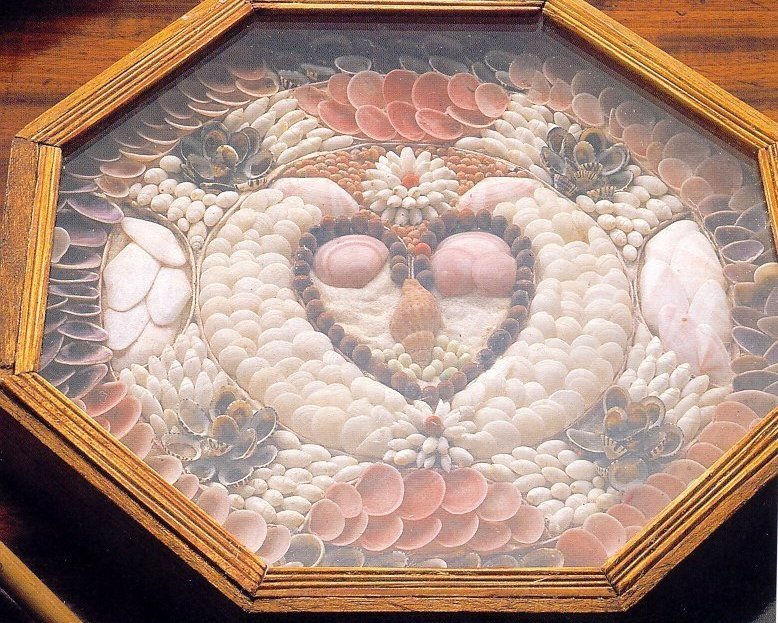 Many genteel females from the royal princesses to gentry were creating pictures and other clever things made of shells. Those who couldn’t get to the beach could buy collected packets of shells at various fashionable shops. Wooden dolls were sometimes dressed in shells. Birds, animals and people were also made out of shells. The dolls were the most popular in the early 19th century, made from common British shells. The dolls with their pretty enameled faces were too fragile for a child to play with, and I suspect they ended up beneath a glass dome to preserve them from little probing fingers. Grottos or “Gothick Cells” were all the rage in the 18th and 19th centuries. An air of mystery surrounding these subterranean and very picturesque caves was enhanced by the shrubberies around the openings. Sea shells decorated the walls and floors of these exotic retreats. Often statues were places in niches, the most popular being a river god. Unfortunately, the shells used in combination with minerals and other things like coral didn’t fare very well in the damp climate. Pope had a famous grotto in Twickenham. Lord Shaftsbury had one at Wimborne St. Giles in Dorset. This was made of imported shells and cost over £10,000. 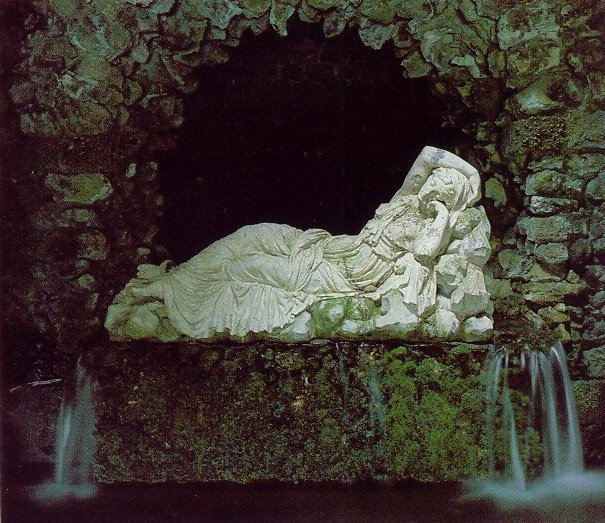 The grotto pictured is to be found at Stourhead Garden. Henry Hoare, the banker, created this paradise in the mid to late 1700’s. Paper–work required a delicate, clever hand in order to draw and cut paper into objects like flowers from ordinary drawing paper. Mrs. Delaney was perhaps the most creative artist in this form of art. She cut out each petal, stamen, and leaf, and then pasted those onto a sheet of black washed paper. Few could match her artistry. Sir Joseph Banks claimed her work could illustrate a book on botany. When you view her work it is difficult to believe that every change in color is a different piece of paper. Quilling was also done, but required a degree of skill. Very narrow strips of paper were round into tight rolls, and then applied to the desired background. The designs could vary from the very simple to incredibly complex. Rolled paperwork was also done. It was called “filigree” at the time. The intricate pattern could be copied from design sheets available from shops such as “The Temple of Fancy” in London. This shop also sold plain objects to be used for decorating. The tea caddy pictured was ideal for decoration, being small and light. This particular caddy must have taken hours and hours of meticulous work by a Suffolk school girl. Pin-prick pictures and designs fascinated a few women. The chosen picture was accented by pricking the picture with pins to emphasize the design or person illustrated. 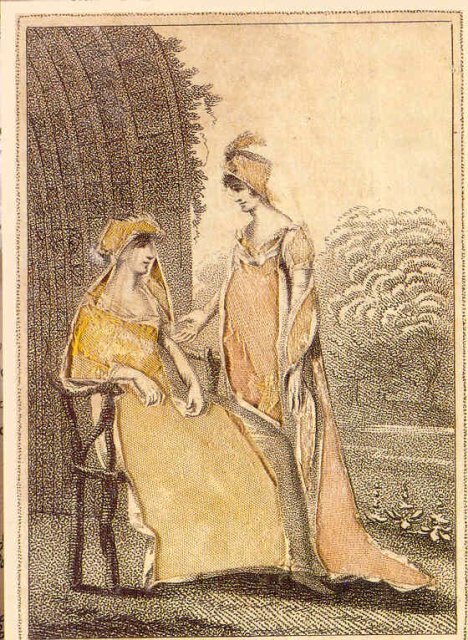 In the early 1800’s a craze sprung up for dressing the fashion prints out of magazines. First the gown pictured was cut out, leaving a space to be filled with fabric. Appropriate fabric was pasted on the back of the prints, producing a rather charming effect. These were often framed to hang in a young girl’s room. I expect they were also to give the woman a fair estimate of how the design might look made up in that fabric. Paper-maché was the result of an attempt to find a substitute for wood what would stand up to the intense heat necessary for the baking of lacquered furniture. By 1772, using panels made of a number of paper sheets pasted together, it was found that the result was so hard that it could be treated exactly like wood - sawn, screwed, joined, etc, Trays, carriage panels, even furniture was made with this process. I even saw a piano made of paper maché. It was often called Japan-work and is highly prized today. 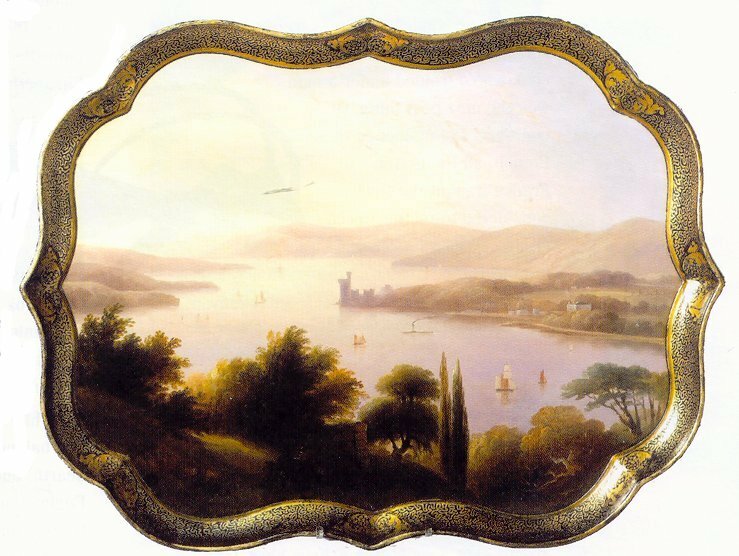 Mary Delaney wrote that “Everybody is mad about ‘Japan-work’, and I hope to be a dab at it by the time I see you.” Few of the amateur efforts have survived, but those created by professionals like Henry Clay have graced the finest homes, even the king’s. Feather-work must have been an absorbing pastime. To collect the variety necessary to create pictures and other things must have necessitated diligent searching. The simplest of this art was to turn the feathers into pictures of birds. The birds were drawn on plain paper and feathers were used rather than paint to complete the image. A number of women kept aviaries with exotic birds whose moulting feathers kept them supplied. Mrs. Elizabeth Montague was famed for her feather “room” in her London home. Peacocks, pheasants, swans, and heaven knows how many other birds gave their all to decorate the walls of one room The trouble with this sort of thing was dust. I read where Mrs. Montague finally cleared out her feather room, unable to tolerate the dust. Her guests had begun to complain! 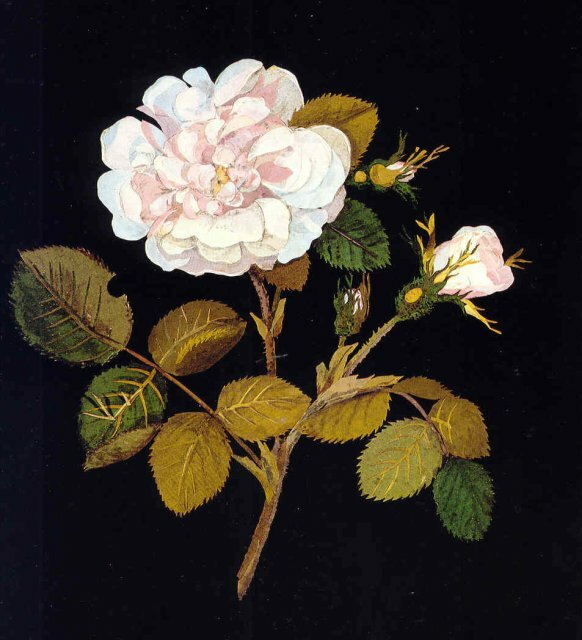 A Regency lady could easily obtain the proper wax to model wax flowers, a pastime considered suitable for girls as it did not affect their posture or give other problems associated with bending over a frame. Mostly it was flowers that were the object of attentions. While this was probably a minor craft in the Regency period, it became overwhelming in the Victorian age, when one could find enormous bouquets of wax flowers set in every available space. Few examples of this exist today, thanks to the Edwardian house clearing of Victorian knick-knacks. At the Victoria and Albert Museum collections web site I found a box of japanned metal illustrated. It held wax, paper and wood flower making materials required to make wax flowers. Although this box dates later than the Regency, tools and a box like this were available to any Regency lady so inclined to pursue this craft. Patterns included garden flowers such dahlias and even one for the scarlet passion flower. Once completed the wax flowers would have been put in a vase and protected by a glass dome. It was a pastime largely enjoyed by fashionable women. Drizzling was done by many who needed a bit of money. One simply unraveled brocades, galloons, laces, tassels and braids, etc, in order to extract the gold and silver threads from them. While at one of the DuPont homes in Delaware I saw a huge tapestry that looked rather dull. When the guide asked if anyone could tell what was missing, I immediately knew – drizzling had taken all the precious threads from the tapestry, leaving it a poor shadow of what it once was. Drizzling became all the rage of the ton – not so much for the money as for its amusement. While it showed off the graceful turn of a young lady’s hands as she worked at her pastime, it also gave her a bit of pin-money. Discarded brocade dresses trimmed with gold and silver lace were pulled from attic trunks to be stripped of their value. The gold and silver epaulettes, sabretaches and tassels worn by naval and military officers also provided a source for the drizzler and doubtless aided the half pay officer who needed a bit of cash. Prince Leopold took it up and apparently spent most of his leisure hours in drizzling. 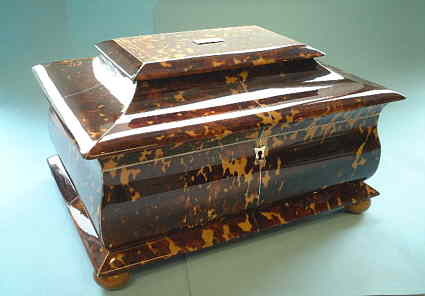 He used a tortoiseshell drizzling box that had belonged to his wife. Inside this neat little box were spools upon which the silver and gold threads were wound prior being taken to a jeweler who purchased them. With such Princely approval it would seem that drizzling was much in vogue, never mind the destruction of gorgeous fabrics and tapestries. No known drizzling box seems to have survived. It is known that various work-boxes were put to use for this. 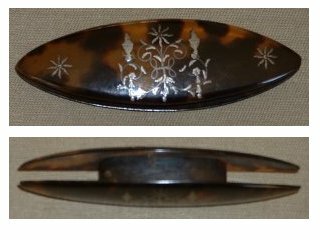 The Victoria and Albert collections do not have a drizzling box per se, bur the work box I chose to include is a tortoiseshell work box, holding small scissors and needles. It would have been ideal for the purpose and it is possible that a lovely tortoiseshell box such as this example held the spools of gold and silver thread wound to take to the jeweler’s shop. Knitting was done - mittens, caps, and scarves, not to forget those knitted slippers or warm “waists” for elderly men. They seem to have been much like a very warm waistcoat of sorts. 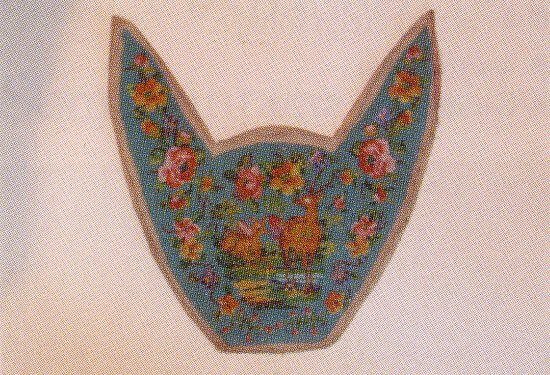 Women often knitted purses for their own use as well as for gifts. Delicate knitted gloves for summer were often created by genteel ladies who perhaps couldn’t afford to buy them. In rural areas, knitters worked to produce stockings for sale, prior to the knitting mills that came later. Crocheting is more difficult to place. It is known that Irish crochet was developed by 1820. It was a simple background with charming designs crocheted and appliquéd on to this. Roses, shamrocks and “whirligigs” were favored designs. Later in the Victorian period we can see baby blankets crocheted by the queen. I have visions of her madly crocheting while in the midst of a council meeting, for she crocheted blankets for all her children, grandchildren and quite a few others as well. 1848 is the date given in the OED as being the first time the word in mentioned in print. Knotting was another bit of fancy work women enjoyed, as they could take it with them quite easily wherever they went. In knotting the shuttle was made from two oval blades of bone, ivory, mother-of-pearl or tortoiseshell, joined together in the middle. There were two sizes of shuttles. This shuttle, which was held in the right hand, would be filled with fairly thick thread and then passed through a loop on the left hand. Mrs. Delaney was given a gold shuttle by King George III while she was living on the Windsor estate. The idea was to produce knots at regular intervals, rather like a string of beads. Miles of knotting much have been produced as it was used on large-scale household items such as chair covers, bedspreads and curtains. The knotted thread was couched onto a cloth, following a drawn design. 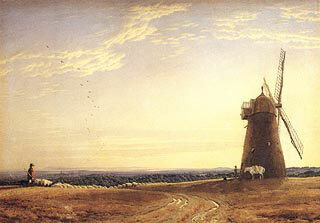 An example produced by Mr. Delaney exists in the Ulster Museum, Belfast. It is a quilt made for a little boy and given on the day of his birth in 1765. 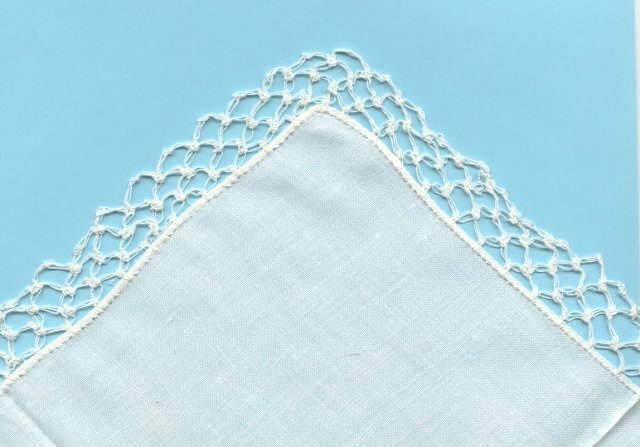 Tatting is a kind of knotted lace, done with a small flat, shuttle shaped instrument from stout sewing thread, used for edging and trimming, sometimes for doilies, parasol covers, etc. In tatting each mesh is fastened with a knot. Tatting-boxes were quite popular and made in a variety of substances, with tortoiseshell being a favorite. Tatting shuttles exist which are said to have been used before 1820. Jane Austen wrote to her sister about netting a reticule. Netting is considered to be a very old craft; pictorial evidence can be seen in Egyptian tombs where figures are shown wearing tunics of netting. Netting, an art all by itself, is the foundation for filet lace when embroidery is worked over the finished netting. Mesh “sticks” are used with a netting needle to make wide loops. For finer netting a knitting needle is used, with thread varying from fine cotton to knitting worsted and even twine. Gold soutache braid could be used to create an elegant reticule for evening. Another craft Jane Austen, her mother and sister Cassandra enjoyed was patchwork quilt making. I saw one they had made while I was at their Chawton house and it is quite charming. Patchwork quilting was a good way to use up scraps of fabric as this was a society where most people didn’t waste anything. Some patches are merely sewn together, but many have delicate embroidery on the seam, usually featherstitching. 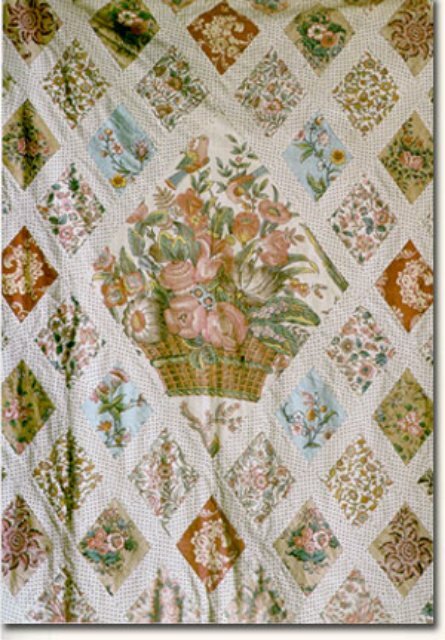 In the Chawton quilt there is a large center design, a bouquet of flowers. The prints used were mainly of cotton in a variety of prints. The Austens used chintz. I have seen silk patchwork as well as wool patchwork quilt tops and I’ve done quite a few cotton one. 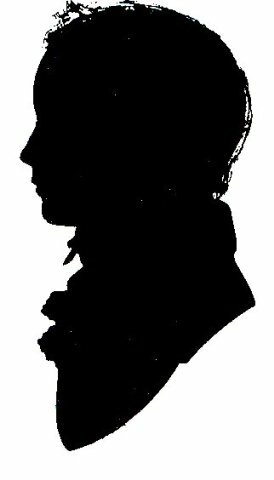 The Princess Elizabeth, third daughter of George III, loved silhouette cutting and spent many hours making portraits of her parents and various religious and allegorical subjects. So involved was she with her paper work that artist Henry Eldridge painted the Princess seated by a window, delightedly engaged in her favorite hobby. With paintings quite expensive, having a selection of silhouettes to hang framed on the wall was desirable.. I would be remiss if I failed to mention the popular pastime of watercolor painting. Whether the young lady went out of doors or remained within the schoolroom with her governess, she was expected to be reasonably proficient with her brush and blocks of paint. At this time, watercolor paint was available in blocks, to which the well-wetted brush would be applied with, it is to be hoped, good results. Some paintings were charming, as illustrated in Making Victorians by Susan Lasdun. Many young ladies had excellent teachers who eked out their living by offering lessons. A final note was the necessity for a young lady to be proficient in some sort of musical ability. As a songstress, a pianist, or a harpist, her talent, such as it was, was trotted out to be demonstrated for visitors, or perhaps as part of an evening’s entertainment. The musician was expected to practice every day, so it is questionable just how enjoyable this pastime might be. English Countryside Needlepoint. Stafford Whiteaker. Ballentine. 1988. Illustration 28 Silhouette: an example of a popular pastime in the evening, even at parties. 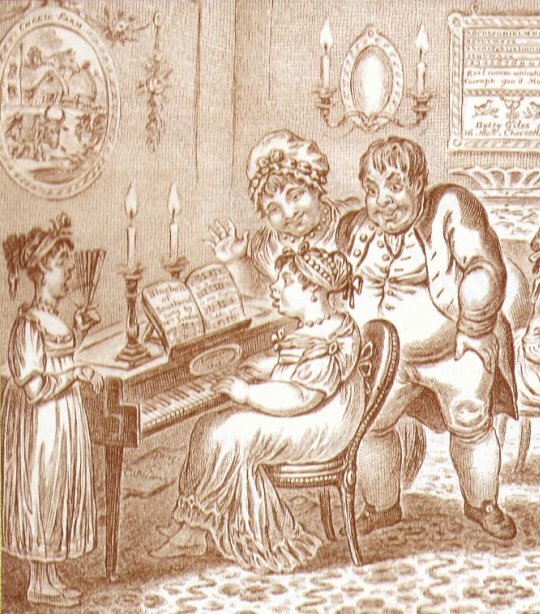 Illustration 30 Talent on the pianoforte was considered a desirable achievement for a young woman entering Society.